Have the best of both worlds and please them all. 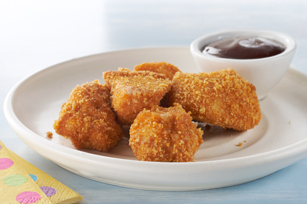 Our baked chicken nuggets are both a Healthy Living recipe and baked to golden crunchy deliciousness. Moisten chicken with water; shake off excess water. Add 3 or 4 chicken pieces at a time to coating mix in shaker bag; shake to evenly coat. Place chicken in 15x10x1-inch pan. Discard any remaining coating mix. Bake chicken 15 min. or until done. Serve with barbecue sauce. Serve with BULL'S EYE Original Barbecue Sauce. Or, for other great-tasting dipping sauce options, serve with KRAFT Classic CATALINA Dressing or salsa instead of the barbecue sauce.